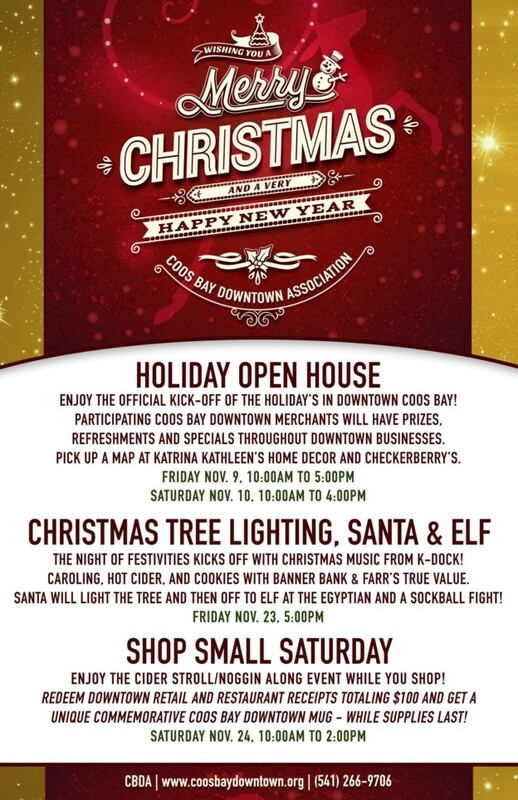 The perfect solution for getting into the holiday spirit and work on your gift giving list is to come to Coos Bay downtown for the Annual Downtown Holiday Open Houses. Mark your calendars to be here Friday, November 9th from 9am to 5pm and Saturday, November 10th from 10am to 4pm as participating businesses open their doors for the Holiday Open Houses. Browse participating shops for gift giving inspirations and Holiday home décor while enjoying refreshments and entering to win door prizes. 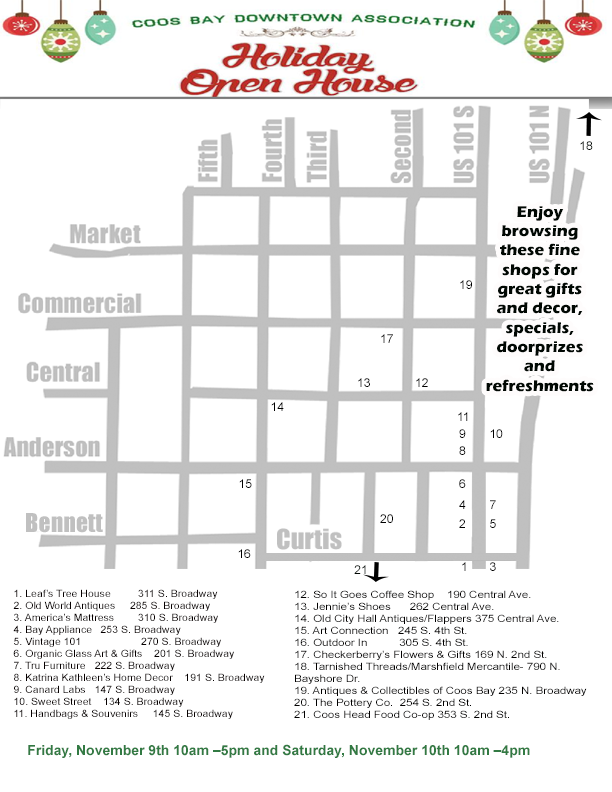 Start your shopping journey at Katrina Kathleen’s Home Décor – 191 S Broadway or Checkerberry’s Flowers and Gifts – 169 N 2nd Street and pickup your Downtown Open House map to more shops all waiting to show you their latest for the gift giving holiday. Bring a friend and make a day of it! On November 9, start collecting those receipts! From November 9-24, shoppers who collect $100 in receipts from Coos Bay Downtown Association merchants can turn them in on Shop Small Saturday, November 24th at Jennie’s Shoe Store – 262 Central Ave for a commemorative Marshfield District mug from 10am to 2pm. 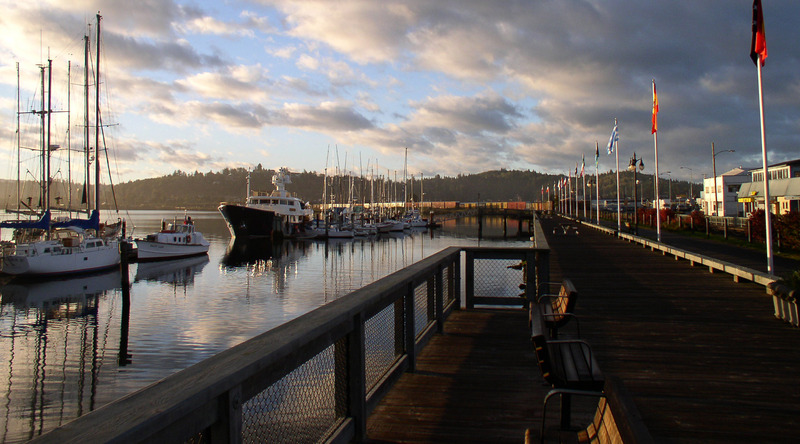 Eat, Shop, Mingle and Explore your Coos Bay Downtown for the Holidays!